The zombie apocalypse theme is not new in cinema. The genre has its fans as well as famous titles. 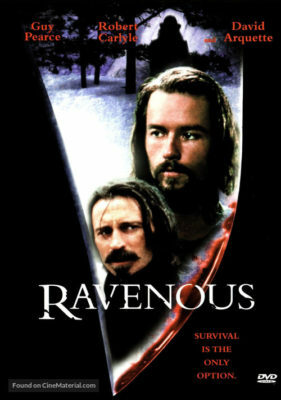 Ravenous is a decent example of the genre, however, it is not exceptional. Ravenous is reminiscent of The Happening by M. Night Shaymalan, but the former is more tastefully done. The title has little to offer in terms of classic gore present in many zombie movies. As the strengths of Ravenous lies in the tension and suspense it has to offer. The ever-present sense of danger and fear captures attention and doesn’t let go until the end. While the characters are generalized, they are worthy of sympathy. However, Ravenous falls short in standing out among many zombie horrors. The story is awfully familiar as it follows a group of strangers struggling to survive. The ranks are thinning the closer they are to their goal. The characters go through the same trust issues any other group would go through in such circumstances, offering an all too familiar plot. It’s predictable to a point of knowing exactly who will die and who gets to live another day. Ravenous is enjoyable to watch as the sounds and visuals in the movie exceed expectations of a typical zombie apocalypse film. It’s a humble, but decent title in the library of zombie horrors.